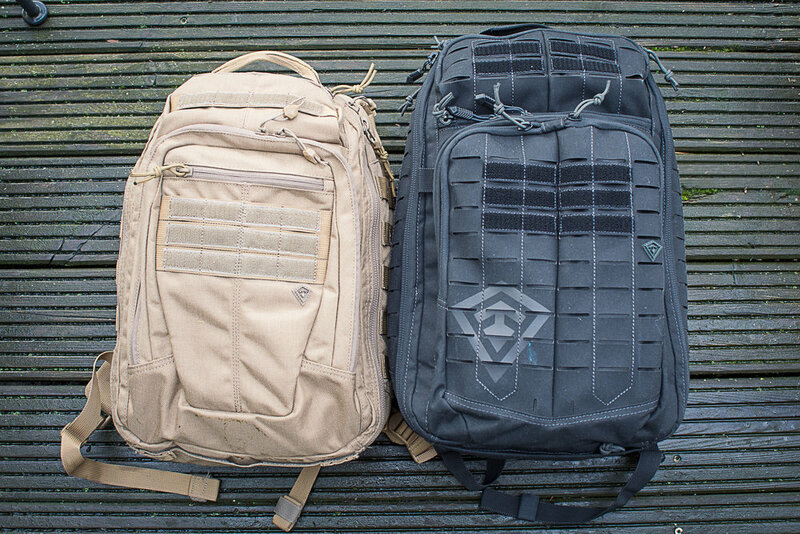 This article is a continuation of the Side-By-Side look at the First Tactical Tactix 0.5 and Specialist Half Day Packs. While today I'll focus on the design commentary for both packs, you can find more detailed photos in Part I. You canpurchase the Tactix here, and the Specialist here. Many of the pockets have smaller pockets inside, such as the rear sleeve and the front two vertical pockets. The greatly increases their usefulness and give the pack numerous options to store small items efficiently. First Tactical has their factory dialed in and there are no quality or durability concerns with this pack. The panel zip main compartment is great. You can get to everything easily. I dig it. The rear sleeve pocket serves well as a laptop compartment, if the user provides their own padded protection sleeve. The inclusion of side grab handles makes this pack easy to manipulate and maneuver no matter where it is stowed. The adjustable suspension ensures this pack fits well when worn with the optional belt. This is a welcome touch on a pack in this price range and makes the pack very comfortable to carry. Speaking of the harness, it is better on the Tactix than on the Specialist. The Tactix is less densely padded and slightly wider, which seems to distribute the load more evenly. I was pretty impressed with the carry comfort of this harness, even up over 20lbs. The CCW pocket is a nice touch for those who need it, although I haven't been able to use it here. Overall, there are many small extra details on the bag. The rain flap and zipper on bottom make the pack more refined and complete. The differentiated zipper pulls and webbing keepers are nice touches as well. The aluminum stay on frame sheet provides a lot of rigidity and make this a contender for hauling a more substantial load when used in conjunction with the belt. Most pockets have their own volume. The value of this cannot be overstated, as many of us have been frustrated to fill one pocket only to find it robbing space from another. This is not the case with the design of the Tactix. The PALS is very flexible. Really, it's everywhere. The removable interior pockets are a nice touch to allow some simple customization without needing to purchase other accessories. Speaking of other accessories, the fleece lined back panel provides great flexibility. The zipper pockets in the main compartment are a nice place to stow things like a pocket organizer and the zipper keeps them well secured. My biggest complaint with this pack is it's size. It's pushing 30 liters in volume, and yet it is billed as a 12 hour pack. That makes no sense to me. I would guess this had more to do with product differentiation and nomenclature than with the R&D team, but it's just too big. As I used the bag, sometimes I wondered who actually needed so many pockets? At least in my usage, I did not, so some of the pockets were details lost on me. The double pockets on front seem the most excessive. I missed the fleece lined upper front pocket seen on the Specialist, even though it has another eyewear pocket up top. The upper front pocket is more easily accessible and better shaped. This made the pocket more flexible and useful for things like my Sony RX100III without a case. As with every First Tactical bag I've handled, the key fob is hard to remove and attach. The size on this pack at 25 liters is much more appropriate for a 12 hour pack. Again, First Tactical's manufacturer is building a quality and durable pack. Again, the Specialist has a full panel zip main compartment. I like it as much here as I do on the Tactix. For me, the Specialist has good, useful organization. I can get all my standard EDC stuff in there with no issue and find it efficiently. I appreciate the upper fleece lined compartment for eyewear or small electronics like my Sony RX100III. When you need more flexibility, the fleece lined back panel has got your back (pun intended). Again, the rear sleeve pocket serves well as a laptop compartment, if the user provides their own padded protection sleeve. The differentiated zipper pulls and webbing keepers are nice touches. The bag carries fairly well and handles weight as it should for a bag in this price range. That is, it handles up to 15-20lbs without issue. The one main issue with the Specialist is the denser padding at bottom of shoulder straps causes a pressure-point against the users ribs while carrying the bag. I got used to it, and it did not keep me from using the bag, but it is worth noting. Overall, the harness on the Specialist was just not as comfortable as on the Tactix and reminded me of the over padded harnesses on some other bags. I missed the pockets inside the rear sleeve that the Tactix has. Without them, it is hard to use that pocket for anything small. Overall I was very impressed with these bags. The Specialist comes in at $90 and in that price range it completes very well. Sure, it's not as refined as it's larger cousin, but it is so feature packed that you hardly notice the small things. It is an excellent value and will suit a lot EDC and tactical users. Speaking of refined, the Tactix comes in at $160, and in this price range a bag needs to start standing out a bit more. For that coin you can look at the imported Mystery Ranch packs, 5.11, Hazard 4 or something like the Alphaoneniner Evade. What sets the Tactix apart from these, is that as a complete pack, there are no glaring flaws. MR is notoriously poor at EDC organization, 5.11 and Alphaoneniner are not the most comfortable to carry and Hazard 4 has that pesky non-removable waist belt. The one pack that probably competes well with this one is the Vertx Gamut (I had a Gammut Plus and loved it). While I listed some cons for the Tactix, none are really more than my nitpicks, and none are what I would consider deal breakers. It has organization and useful design and carrying comfort. So, despite it being nearly double the cost of the Specialist, I am happy to say that this pack poses a good value as well. If you look through my archives, you'll see that I have worked a lot with First Tactical in the past. What impresses me the most is the consistency of quality I see from them. All is the packs are constructed as they should be with nary a wandering stich. They achieve a quality above their price and should be highly commended for this. If some of their designs suit your needs, I'd say give them a look!